I’ve read a lot of single (non-series) books, probably more this past year than I have in 5 years. Its been great fun. Are you by chance on Goodreads? I’d love to get some fellow bookreaders on there. I have not looked into that but maybe I should. I don’t know much about it. I am always looking for book suggestions and I am always way behind the times in book world. I’m never up on the latest reads. My kiddo doesn’t really have a summer per say but sometimes I worry if he’ll ever stop liking books. Before when he was younger, we easily spent 3-4 hours a day reading. I suppose now that he’s a toddler and is so mobile he really wants to explore his surroundings and everything else that comes with it. That said, we still make it a point to read 4 books every time he goes to sleep, and usually I’ll crack one of his books open and read it, which will entice him to check out what I’m reading. I will have to check out your suggestions…especially the Grace books. My son is a huge fan of the Diary of a Wimpy Kid books. One of his favorite authors to read aloud right now is Gary Paulsen. I can’t wait for my kids to get into the Little House books. I have the entire collection from my childhood in storage, I’ll have to dig them out. But I will settle for Judy Blume. My son is reading Tales of a Fourth Grade Nothing to me at night this summer. We went through Diary of a Wimpy Kid last year. It had me and my son rolling. Can’t wait for the movie in August. I have not been able to get my son to read Gary Paulsen. So many great books out there he hasn’t read. I’ll have to try one of my tricks I guess. I never read the Little House books as a kid so I’m loving reading them with my daughter. Great stories for snuggling up with at night. And Judy Blume was a childhood favorite! I loved Little House when I was a kid. I got to see the musical a few years ago with Melissa Gilbert playing Ma. I think I appreciated it more than Dimples, though. Watch out–most folks I’ve talked to agree that while the whole trilogy is pretty good, the first book of the Hunger Games series was the best. Thanks for all the reading suggestions! I’m taking notes for the future; we love our books around here! Yeah, I did hear the second one wasn’t very good but you have to get through it to see how it all wraps up. The first one does a good job of leaving you wanting more. We’re always on the lookout for book suggestions here too. Personally, I could not put any of the books down. Read the whole series in a weekend and loved all three books. Definitely a page turner series for my daughter and me! I am not sure the ages, but my son and countless nieces and nephews thoroughly enjoyed the Artemis Fowl books by Eoin Colfer. We even went to a book signing when my son was about 11. Wonderful. These books were the source of my very favorite Google search ever. It was time to get the books for one of my nieces, but I couldn’t remember the name of the book, the author, the main character or anything else, but I remembered that they were wonderful.. Then I remembered one of the characters and promptly Googled “Books with Farting Dwarfs.” BINGO! Artemis Fowl by Eoin Coifer. And yet another tip on how to get my son to read a book: If I tell him this book has farting dwarfs, he is sure to read it! Awesome. Both my kids love Harry Potter, or simply HP, as we like to call him. Both kids also enjoyed the Percy Jackson series. 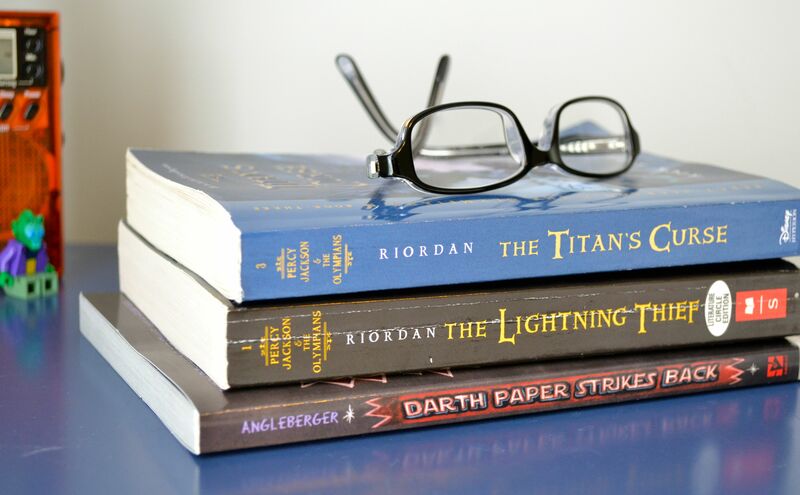 Riordon also has other series, The Kane Chronicles (first book is The Red Pyramid) and another series, first book is called The Lost Hero, I think. So, after Percy, there is more Riordon books!! My daughter is a Hunger Games fanatic…we even attended the midnight premier of the film in March. I read the series and I love it as well. My son has read the Artemis Fowl books and loved those also. James Patterson has a series for kids/teens called Maximum Ride which both my kids have read and enjoyed. My son is currently reading the John Carter books, which were written around the turn of the century…early science fiction. He is digging it. The John Carter film that came our recently is based on that series. I am reading The Hobbit and C S Lewis’s Screwtape Letters. I generally never read more than one book at a time, but I am reading Screwtape for a book club I am in. Thanks for those great recommendations! I’ve never heard of some of those. Aw, the Little House books! I can’t wait to share those with my kids when they get a little older. Right now my daughter loves when I read her the Junie B. Jones books. Do you have to talk like Junie B.? My son actually liked those books at school, but my daughter never got into them. I’ve only read one. She’s a character. I thought we’d never get out of Magic Tree House. The kids were actually lining up all of those books yesterday telling me which ones they were ready to get rid of. Great post. 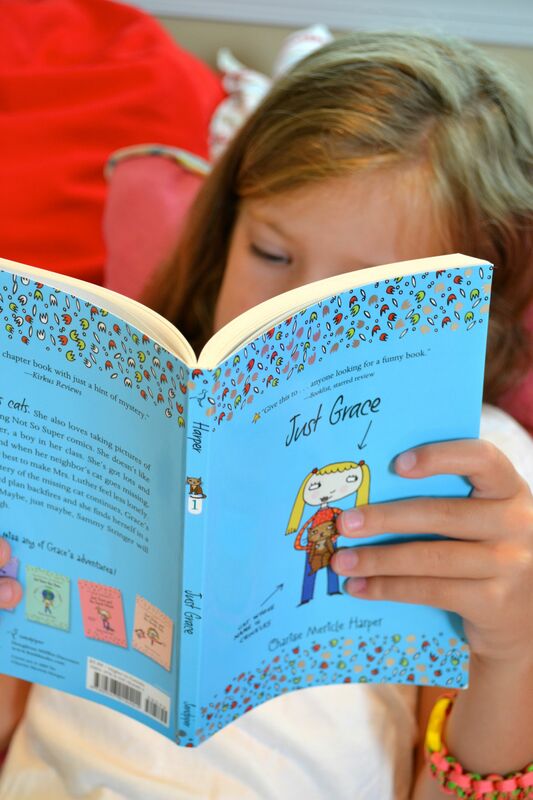 I can ‘t wait to check out the Just Grace series with my daughter. My oldest loved the Percy Jackson series and is now loving the Olympians series. Will check out a bunch of the others too. Thank you! All good books. My two kids no longer require a bedtime story, which is good and bad but life moves on. Last night after dinner the three of us were sitting in the den, each of us with a nose in our book. My son was reading a book based on popular comic, come game, now book. He was complaining the chapters were too long. As a writer myself I made a note to check the chapters on my WIP. I am reading Shadow of Night, Deborah Harkness.. cannot recall the name of the book my daughter is reading. It’s a memoir. Anyway, great list of recommends. I quite enjoyed the Percy Jackson books. My kids don’t complain about chapter length too much. They’ll just stop in the middle if they have to. When I read to them, I’ll stop in the middle so I don’t think they feel like they have to always stop there. Just FYI. But I guess some kids do like them short. I’ll have to check out Shadow of Night. I was curious about that series. Thanks for the tip! We love ALL the Ramona books.My grandkids and I read everytime we are together,really they are always conning somebody to read.Thank you for some of those ideas.Next time we go to the library I will be scouting. I loved Ramona as a kid. I can’t get my daughter into those, but maybe after Little House. Ramona was so funny. My son liked the Henry books. i’m reading, the stephen king book 11/4/63 or something like that, and just finished girl gone or gone girl, or something like that. I’ve never read any Stephen King but my dad always did growing up. That one you mentioned actually got me curious. Maybe I’ll try it. I may be too much of a wimp for him.